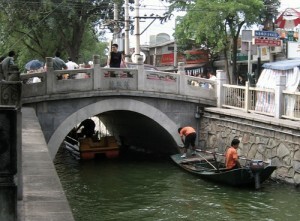 It is a narrow channel joining Qianhai Lake and the Houhai Lake, the hub of Shichahai area with surrounding quiet hutongs. In the history, it was very much like a silver ingot upside down. Later, it went through some changes, but it still keeps in its shape. Li Dongyang, a Ming Dynasty person, once called it the first natural beauty in the Beijing City. Seeing the west mountain here is known as one of the eight old Beijing wonders — Yinding Guanshan meaning “Enjoying the view of the west hill while standing on the Yinding Bridge”. Now people can take a boat and go across the bridge from Qianhai Lake to Houhai Lake or vice versa. Lots of bars are surrounding the bridge, the hub of the Shichahai bar area.